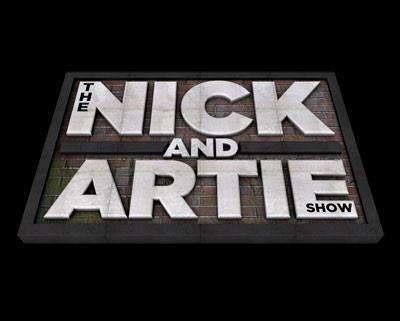 “The Nick and Artie Show,” Nick DiPaolo and Artie Lange’s new weeknight sports/entertainment radio talk show, has a name, a timeslot, a logo, a website, a Facebook page, a backing distributor and a launch date: Tonight. Now all we need to know is where we actually can listen to it! Lange’s big comeback with DiPaolo (and without Howard Stern) will come via DirecTV in selected terrestrial radio markets tonight at 10 p.m. Eastern. UPDATED: I know of at least one of the 30 markets you can listen to Nick and Artie — 940 WINZ in Miami, which also allows you to listen live online from anywhere else from 10 p.m. to 1 a.m. Eastern time. When I learn of additional markets to listen on your old-school radio, I’ll update it here. And tonight’s debut will likely start late due to Monday Night Football. You know Artie from his decade with the Howard Stern Show and Nick’s successful stand up and radio career. This is the Fan’s show. Nick and Artie will bring a whole new blend of sports, celebrity guests, pop culture and some of the funniest observational humor anywhere on the radio. The Nick and Artie Show preview clip. If you miss the debut tonight, I’ll have it up for you afterward. They started the show talking about the epic events that had happened a week before with the Red Sox and Yankees. UPDATED: You can listen to each night’s broadcast live or afterward at NickandArtie.com. In a press release DirecTV published Wednesday, Oct. 5, they didn’t list any specific terrestrial radio outlets but did reiterate the online streaming and archiving method, as well as announcing plans to simulcast the radio program on DirecTV in 2012. And in case you missed it, you can see Artie Lange’s video message to the fans, which he delivered via The Comic’s Comic last month.